PLEASE NOTE: Due to increased demand at this time, some sizes may be backordered. Backorders will be held until items are back in stock. Any additional items ordered will ship immediately. If you have any questions, please contact us. Need a place to put all of your fun patches that you have earned while leading your girl scout troop? Need a place to put your own Adult Insignia? Well we have just the thing for you! Our council store has created a vest specially made for our leaders. This Adult Navy Blue vest with embroidered "Leader" in white is the perfect opportunity for you to look and feel just like your own Girl Scouts. This leader vest comes in sizes: Adult Small, Medium, Large, X-Large, 2XL, & 3XL. PLEASE NOTE: Due to increased demand at this time, some sizes may be backordered and may ship separately. If you have any questions, please contact us. All Girl Scouts age-levels (Daisy, Brownie, Junior, Girls 11-17, and Adult Girl Scouts) wear this pin on the left side of the uniform directly above the Membership Pin on the Insignia Tab. A Girl Scout can choose between this or the Contemporary Membership Pin - Item # 09014. It is worn on the Insignia Tab on the left side of the uniform, centered above the heart. A Girl Scout can choose between this or the Traditional Membership Pin #09001. It is worn on the Insignia Tab on the left side of the uniform, centered above the heart. Leaders have Starter Kits Available Now! with a Free Tote Bag makes this the perfect start for every Leader to begin their adventure in Girl Scouts! 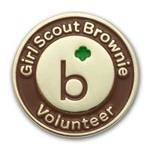 Goldtone pin with Brownie shorthand symbol in center and brown border with "Girl Scout Brownie Volunteer." 3/4" round. Butterfly clasp. Imported. Volunteer pins do not have any requirements and volunteers may purchase for themselves. The Adult Volunteer Grade level pins are worn on the right side of the Adult uniform. Volunteer recognition pins such as these age level pins can be worn below the name ID tag on the right side since they are Volunteer recognitions, not earned awards. 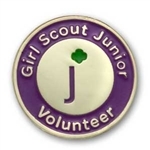 Goldtone pin with Junior shorthand symbol in center and purple border with "Girl Scout Junior Volunteer." 3/4" round. Butterfly clasp. Imported. Volunteer pins do not have any requirements and volunteers may purchase for themselves. The Adult Volunteer Grade level pins are worn on the right side of the Adult uniform. Volunteer recognition pins such as these age level pins can be worn below the name ID tag on the right side since they are Volunteer recognitions, not earned awards. 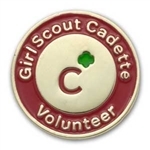 Goldtone pin with Cadette shorthand symbol in center and red border with "Girl Scout Cadette Volunteer." 3/4" round. Butterfly clasp. Imported. Volunteer pins do not have any requirements and volunteers may purchase for themselves. The Adult Volunteer Grade level pins are worn on the right side of the Adult uniform. Volunteer recognition pins such as these age level pins can be worn below the name ID tag on the right side since they are Volunteer recognitions, not earned awards. 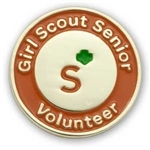 Goldtone pin with Senior shorthand symbol in center and orange border with "Girl Scout Senior Volunteer." 3/4" round. Butterfly clasp. Imported. Volunteer pins do not have any requirements and volunteers may purchase for themselves.